The Marshall Plan was developed by Cindi Marshall Oakey who is a Trend Analyst and who loves to eat yet has struggled with losing weight. After decades of fad diets she undertook nutrition studies and devised a lifestyle for eating, drinking and looking good. The Marshall Plan is based on eating for optimal health without having to give up your favorite foods. She says it is not a diet but a lifestyle. You will learn how to choose healthy foods most of the time and enjoy guilt free splurges occasionally. 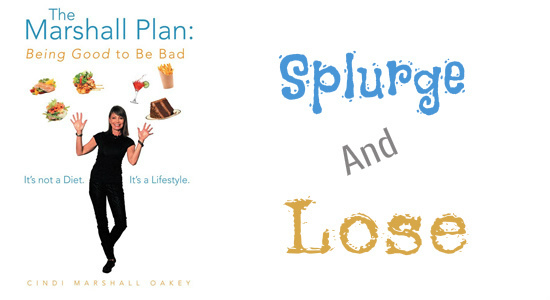 Over the years Cindi Marshall Oakey developed a strategy for balancing healthy eating with occasional splurges so you never feel deprived. The Marshall Plan calls this approach “Being Good to be Bad”. You will intentionally choose good foods most of the time. You will also intentionally choose when to splurge on bad foods. And when you do indulge you will enjoy it to the fullest extent. The Marshall Plan outlines a few simple rules for “being good”. There are also many foods you should avoid. They include soda, fried food, butter, mayonnaise, ketchup, white potatoes, French fries, white rice, white pasta, white bread, sugary cereals, granola, full-fat cheese and alcohol. You also shouldn’t eat anything after 8pm. The Marshall Plan advises following these recommendations from Monday through to Wednesday or Thursday. She acknowledges that everyone won’t eat perfectly for the entire time but it is a goal to work towards. However, she also warns to be careful of trying to be good 100 percent of the time because this can lead to overeating and even binging. Eating healthy during the week means that you can splurge a little on the weekend. As long as you practice mindful eating all week you will lose weight. You might lose two pounds during the week and only gain a pound on the weekend. But when you average it out you net a one pound loss that week. If you have more than five pounds to lose you may have to be a little more good. That doesn’t mean giving up splurges. You just have to choose them more wisely and indulge less often. Seafood, chicken breast, steak, tofu, low fat cottage cheese, quinoa, brown rice, chickpeas, black beans, spinach, arugula, broccoli, kale, asparagus, green beans, bok choy, watercress, red peppers, mushrooms, jicama, sweet potato, avocado, walnuts, blueberries, tangerines, bananas, apples, dark chocolate, cinnamon, herb tea, low-sodium V8. Movement is important for burning calories and increasing your metabolism. You can start by walking an extra 10-15 minutes a day. As your fitness improves you can then gradually increase your level of activity. The Marshall Plan: Being Good to Be Bad: It’s Not a Diet. It’s a Lifestyle retails at $12.99. Does not require dieters to give up any of their favorite foods. Encourages enjoyment of meals and a flexible approach. Can be adapted to suit any lifestyle. Won’t appeal to dieters who prefer to follow a structured program. Weekend indulgences may increase calorie intake and impede effective weight loss. The Marshall Plan advocates a relaxed and flexible approach to eating and weight management. When you follow a healthy diet during the week you can indulge on the weekends and still lose weight. This program will appeal to dieters who like to make their own rules and don’t want to feel deprived. However, it is important that splurges are not too excessive otherwise the increased calorie intake may interfere with weight loss.